On November 8, 2014 at the Boardwalk Hall in Atlantic City, NJ future Hall of Famer Bernard Hopkins entered the ring as the unified IBF/WBA Light-Heavyweight world champion in an attempt to further unify the Light-Heavyweight division as he took on undefeated WBO world champion and knockout artist Sergey Kovalev. Hopkins, a fighter known for defying odds was attempting at age forty-nine to take another step toward an accomplishment no other fighter in the history of Boxing has been able to do, completely unify a second weight class. It was not to be however, as Kovalev would win a twelve round unanimous decision to unify three of five world championships in the division. Although Hopkins will always be known for his accomplishments as a Middleweight in setting the all-time record for consecutive title defenses by a world champion in the history of the division of twenty between 1995-2005 and fully unifying the division during his reign, he has suffered some setbacks over the years and has lost a few fights along the way. The setback suffered against Sergey Kovalev one might argue was different in that it was the first time in Hopkins’ illustrious career that he was dominated. Readers may recall shortly after the loss to Kovalev this observer stated that the question coming out of that fight was whether or not Hopkins’ age had finally become an issue for him. I closed my thoughts in the post-fight column for that fight by saying that although it would be Hopkins who would ultimately decide whether or not he wanted to fight again, it was and remains my opinion that he has nothing left to prove with his legacy and status as a legend and future Hall of Famer more than secure. Even though there was never an official announcement of retirement from Hopkins, one may have believed after no fights in 2015 that Hopkins may have quietly closed the book on a great career. This will not be the case however, as the now fifty-one year old Hopkins will return to the ring for the first time in over two years on Saturday night as he takes on current WBC number two rated contender Joe Smith Jr. at The Forum in Inglewood, CA for the WBC International Light-Heavyweight championship currently held by Smith. As some may recall, the twenty-seven year old Smith scored the biggest win of his career earlier this year by scoring a devastating first round knockout over longtime contender and former world title challenger Andrzej Fonfara in Fonfara’s adopted hometown of Chicago, IL. 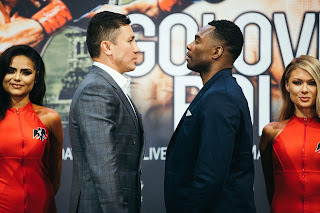 Smith, who will enter this fight with Hopkins having won twenty-two of twenty-three fights as a professional has scored eighteen knockouts in those twenty-two wins registering a career knockout percentage of 78%. Although it may be logical to assume that some casual followers of the sport likely consider Smith to be an unknown commodity, despite his recent victory over Fonfara, which also earned him significant television exposure as the fight was shown on NBC here in the United States, he has been unbeaten for over six years and has scored knockouts in five of his last six fights. What interests me about this fight is to see whether or not Smith will attempt to impose his will on the fighter nearly twenty-five years his senior from the outset. It is important to remember that Hopkins is after all coming off of a two-year layoff and in his last fight he suffered a first round knockdown at the hands of Sergey Kovalev. What one should also keep in mind is Hopkins was sporadic with his offense in the fight against Kovalev only landing 65 of 195 total punches throughout the twelve round championship bout. It is certainly logical to question whether or not “Ring Rust” will be a factor for Hopkins after a two-year hiatus especially given that he will be turning fifty-two years old on January 15, 2017. The significant advantage Hopkins does have going into this fight is in regard to experience. Despite his setbacks in losing some close fights over the years, Hopkins has always been able to be crafty and with the exception of his last bout against Kovalev always left a question as to whether or not he won some fights that ultimately went against him on the official scorecards. Although Hopkins, who will enter the fight having won fifty-five of sixty-four bouts as a professional was bested convincingly for the first time in his career against Kovalev, it should not be overlooked that even as Kovalev was dominating that fight, Hopkins was still able to make his opponent miss and miss often with his offense as Kovalev landed 166 of 585 total punches. If Smith does indeed look to impose his will on Hopkins from the outset, it will be interesting to see whether or not Hopkins will attempt to use his opponent’s own aggression against him and capitalize on that opponent’s mistakes as he has in the past most notably in his Middleweight championship unification bout with Felix Trinidad in September 2001. It will be crucial in my opinion that Hopkins dictate how the fight is fought from start to finish if he wants to be successful. This observer believes that the question of whether or not it was his age or if Hopkins simply had a bad night at the office against Kovalev will be answered early in this fight. One should also remember that the pace in which the fight between Hopkins and Kovalev was fought, was one that was a tactical and measured pace, which is where Hopkins usually excels, but in that fight he simply could not let his hands go consistently and that was the story of the fight. Hopkins must not only control how the fight is fought, but he must also be active with his offense in order to be successful. Even though Hopkins has been insistent in the build up to this fight that this will be his last fight, this observer is not so sure. One would have to assume if Hopkins were to lose this fight that it would be in his best interest to call it a career as he has other roles in the sport including as a promoter and as a broadcaster for HBO Sports. If Hopkins were to defeat a fighter who is ranked number two in the world by the World Boxing Council (WBC) and number five in the world by the World Boxing Association (WBA) and did so in convincing fashion one could assume that Hopkins would seek another opportunity at a world championship in what would be his second attempt to break his own record as the oldest fighter in the history of Boxing to win a world championship. Before that possibility can be discussed however, he must win this fight. We will see it Bernard Hopkins can defy the odds one more time on Saturday night. The official weigh-in for Saturday’s Light-Heavyweight bout between future Hall of Famer Bernard Hopkins and top Light-Heavyweight contender Joe Smith Jr. took place earlier today in Inglewood, CA. The official weights for the entire card are as follows. Main Event: WBC International Light-Heavyweight championship – 12Rds. Joe Smith Jr. (Champion) 174lbs.vs. Bernard Hopkins 174lbs. WBO Cruiserweight world championship – 12Rds. Oleksandr Usyk (Champion) 199 1/2lbs. vs. Thabiso Mchumu 198 1/2lbs. North American Boxing Federation (NABF) Featherweight championship – 10Rds. Joseph Diaz (Champion) 126lbs. vs. Horacio Garcia 125 3/4lbs. North American Boxing Association (NABA) Jr. Lightweight championship – 10Rds. Carlos Morales (Champion) 130lbs. vs. Charles Huerta 130lbs. Jason Quigley 159 1/2lbs. vs. Jorge Melendez 158 1/2lbs. Christian Gonzalez 134 1/2lbs. vs. Jonathan Perez 133 1/2lbs. Ryan Garcia 131 1/2lbs. vs. Jose Martinez 131 1/2lbs. Ivan Delgado 131 1/2 lbs. vs. Roberto Rivera 133lbs. Joet Gonzalez 125 3/4lbs. vs. Jairo Ochoa 125 1/4lbs. Hopkins vs. Smith takes place tomorrow night (Saturday, December 17th) at The Forum in Inglewood, CA. In the United States, the fight can be seen on HBO Sports beginning at 10 PM ET/PT. Check your cable/satellite provider for time and channel in your area. For more information please visit: www.hbo.com/Boxing. In the United Kingdom and Ireland, the fight can be seen on Box Nation beginning at 3 AM (Sunday, December 18th Local UK Time.) Check your listings for time and channel in your area. For more information please visit: www.boxnation.com. Check your listings internationally.